Built from the same design as ICOM's popular IC-F3161 series radios, the IC-F3261DS / IC-F4261DS is a world-class, professional two way radio with all the same great features, they've just added more. The IC-F3261DT / F4261DT radio is waterproof (IP67 rating), and has extra loud audio to be heard even in noisy locations. It supports both analog and digital two-way communications. The mixed mode operation allows you to replace your current fleet at your own pace, while still being able to take advantage of digital technology capabilities one radio at a time. The IC-F3261DS / IC-F4261DS radio is not only waterproof, but provides superior dust and particle protection with the IP67 rating. In addition, it has been tested to MIL-STD 810 C, D, E, F, & G specifications! Most radios are tested to pass C through E or F. Few radios meet the MIL-810-G standard. MIL-STD-810-G is a set guidelines focused on the process of tailoring product design and test criteria to the specific environmental conditions an item (in this case a radio) is likely to encounter during its usage in particular applications. Radios meeting this set of standards have passed a set of tests more likely to predict the products' long-term performance in real-life situations. It considers detrimental effects of various environmental factors on that specific product throughout its service life. Of course the IC-F3261D/F4261D has all the signaling capabilities a top-grade radio would have: 2-tone, 5-tone, CTCSS, DTCS, and MDC 1200. 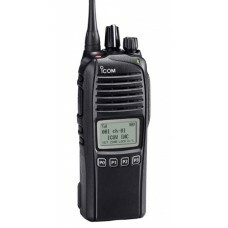 This radio also supports BIIS 1200 signaling which allows short status messages and text'ing to be sent and received. The 512 memory channel capacity, with 128 zones, allows you to divide and store a variety of channel groupings for versatile and efficient fleet management. Direct input of channel numbers, list numbers, IDs can be made using the keypad. There are so many signaling and channel management features, we have listed them all under the 'Features' tab for this radio. Just like it's cousin, the IC-F3261D/F4261D has a numerous security features. The built-in Inversion Voice Scrambler provides secure conversation. To protect radios from unauthorized use, there is a Auto Key Lock which can automatically key-lock the radio after a set time period. With the Clone Read/Write Password function you can set a password of up to 16 characters, protecting the radio from unauthorized use. The Lone Worker function sounds a beep and requires you to push any button if the radio is not used for a defined period of time. If a button is not pushed, the radio automatically transmits an emergency signal to alert co-workers or a dispatcher. The built-in Man down function will automatically send an emergency signal when the radio has been left in a horizontal position for a defined period of time (not available on the all models). To help manage communications, the IC-F3261D/F4261D has several scanning features; • Mode dependent scan • TX channel programmable • Talk Back function • Talk Back timer beep • Nuisance Channel Delete • Monitor Key Action The Voting Mode feature detects the signal strength level of repeater stations and automatically selects the strongest station, useful for roaming between 2 or more repeater sites. Once you select the Voting Mode to a memory zone, you can easily start voting mode operation by changing the zone setting. The IC-F3261D/F4261D is LTR ™ ready right out of the box. It has built-in support for both conventional and trunking operation in both digital and analog modes. Both LTR ™ trunking and conventional channels can be set in the radio. Group, selective (DTMF), and Phone Call are available in the LTR™ mode. Conventional operation and Talk-Around are both available by simply pushing a button, even while you are operating in LTR™ mode. All basic LTR™ features including; Group, Selective, and Phone Call, are available. The keypad version has direct dialing capability. You may assign operating modes, default talk group for home button, power-ON home or previous group, network roaming, offset frequency by channel, LTR™ polarity by system, home channel and area bit by system. The radio has an ATB Ring Back (All Trunk Busy) function, when the ATB Ring Back is set to ON, the radio starts searching for a clear repeater, if all repeaters are busy it will continue to search until one is available then it will ring you back and transmit after a clear repeater channel is found. ¹ Man Down feature not available on all models.